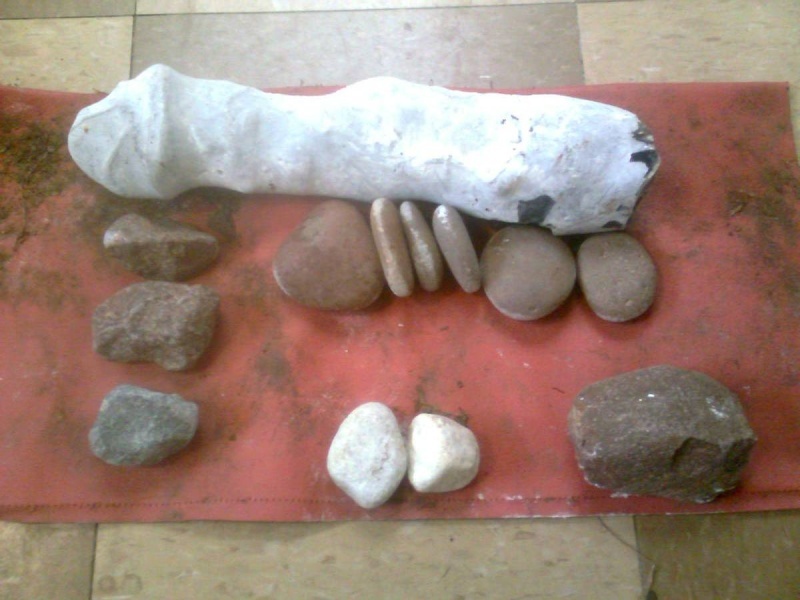 i thought i'd share pics of my knapping kit, and explain how i came across most of it. this is knapping on a shred of a shoe string, aka womble knapping or pov knapping! i initially scavved leather from the offcuts/waste pile of a leatherwork teacher, but this soon ran out as i used to demonstate the dangers of sharp flint to students by geting them to slash taughtly held leather with a flake they had just struck, making them aware just how easily they could hurt themselves if they didnt listen to me. worked a treat, but used much of my stash. now i have to be sharper eyed as budgets have tightened at work. i often carry a knife when out and about (working where i do, and the fact that local police know us due to some of our students getting into regular trouble them, i have no qualms about explaining to them that i work in arts and crafts , and field and forest, therefore having good reason to carry one as a tool) so whenever i see a sofa left out for the rubbish men, or some fly tipped stuff, or a skip etc etc i rummage through and cut off what i can use. the piece with a (thumb) hole in is for pressure work, saw it in a photo on paleoplanet and copied it. i dont use it at all, i just use scraps of whatever size seems right at the time, usually using three layers just in case after reading of folk severing nerves in their fingers with long, sharp pressure flakes. i rarely use the glove too, but it's good to have, i dont count it as an expense as it from my gardening kit. 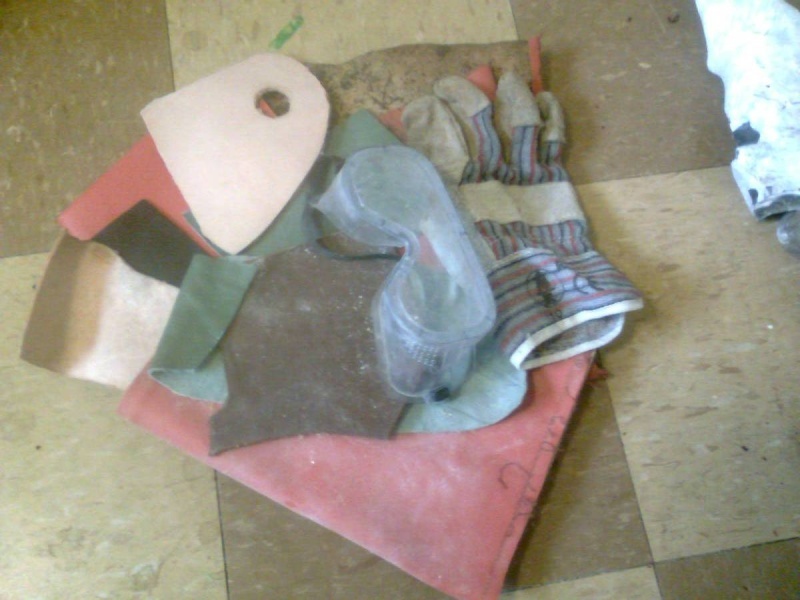 i much prefer using scraps of leather. the goggles are essential ofc, i have had a few bits go in my eyes when i aint worn them and its a proper worry when yr trying to wash sharp flint out of your eye. they cost a mere pound from wilkinson and you'd be daft not to own and use them. The two broken ones on the left are quartzite former river or glacier pebbles (i believe) from the Kinver area - i have trouble finding large ones without cracks, but no matter as there are thousands and they are easily replaced when they break. one day i may just dig a hole and get some that havent been hit by frost and cracked. 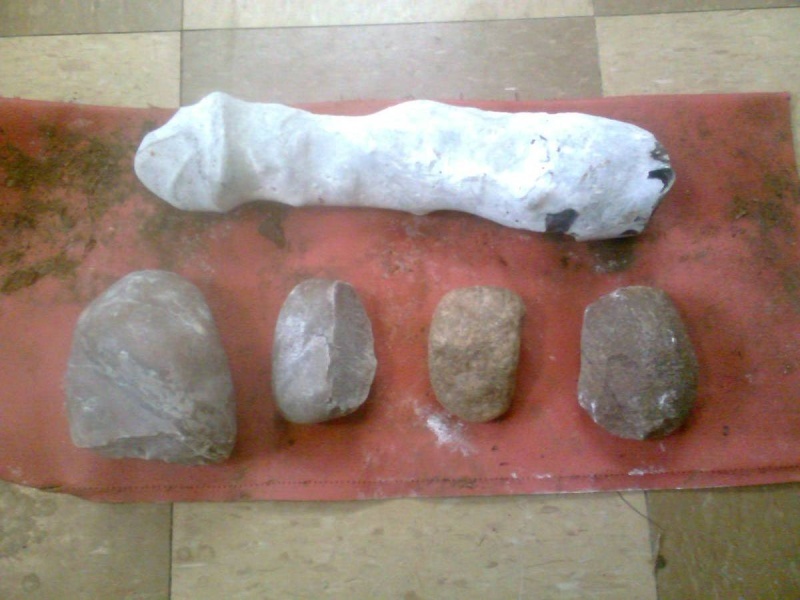 the one on the far right is a hard-ish sandstone (from Kinver again), not as heavy or dense as the quartzite and more prone to breakage. i use it for smaller flakes, and like it a lot as the rough texture grips the stone, and it's "softer" so you get less of a bulb. the middle one is from the Bridgenorth area, no idea what kind of stone but it's very dense, it's a recent find and not fully tested yet - if i like it though i will obviously get more of them. no cost at all for this. dont pay for rocks unless they are shiny or sharp. the stones on the left are granite, and are from railway ballast. i wasnt reckless enough to go on the track, they are from an adjacent car park (severn valley railway). they are very dense and heavy and i like them a lot.. again the rough texture grips the stone quite well, and they double as excellent abraders. top centre are a selection of smaller quartize stones, many are quite flat like "skimmers" and are good for hitting accurately. they are smooth initially which i dont like, but they soon rough up once used a bit and swiftly improve. there are loads of these in my local area. at the bottom are some odd quartz like pebbles/stones with a rough crystal like texture, they have excellent grip and i lifted them from the top of some plant pots where they seemed left for decoration or mulching. the plants are still doing well, i checked. on the right is the sandstone shown previously, i have some more of these at work, though not to hand now to photograph. i like sandstone a lot so far, as it is softer and rougher - easy to use and with pleasing results. here are a couple of simple, light boppers i made at about £3.50 for two of the 22mm plumbing copper end-caps. these are somewhat extravagant. the caps were just put on the end of a holly and hawthorn stick respectively, as it's fairly dense, heavy wood and i had plenty to hand. they are pretty good for fine work and the cap are not rounded - i just rounded the ends of the sticks a little and made them the right thickness. the length of the handles means you can get a decent swing, but i usually use my granite hammer stones instead. 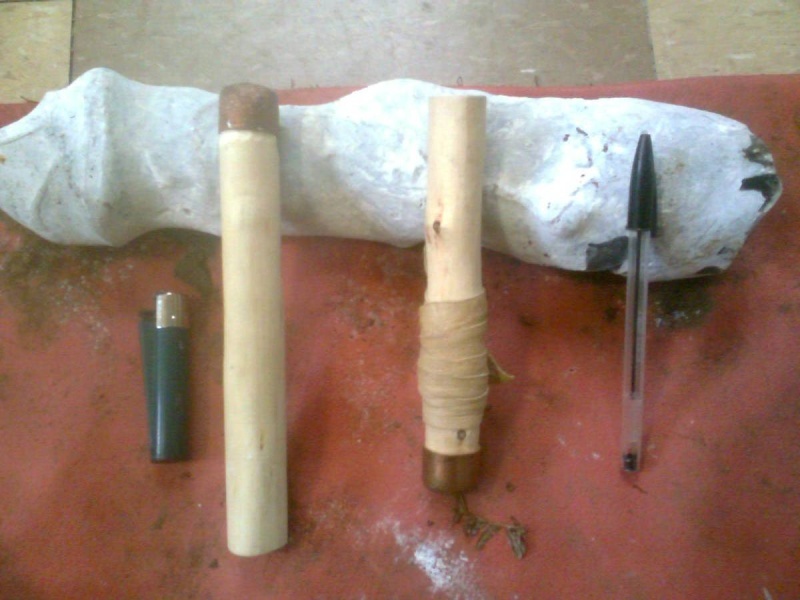 the one on the left is from a bone found when on a walk and stopping for a call of nature, i'm glad i was paying attention. i reckon it's from a cow's leg - it had been sawn to a ten inch length, was clean and hollow and a nice but strange find. i cut it out of the whole with a hack saw easily enough, but it made a lot of dust, and folk say you should wear a mask to avoid the dust which can contain lots of nasties. the rest of the bone has gone on needles and blanks for points, as well as a flaker for a friend who i am helping get a starter kit together. on the right is a copper tipped flaker, i just split the stick through the pith using knife and baton. then i scraped a bit of pith out of each half (with a handy flake, which did an excellent job) to fit some copper wire (about 1 mm thick) inside. the copper is prevented from slipping inside the stick by bolstering the pith at the base of the wire with a little sliver of wood. it is bound around with rawhide from a knotted rawhide doggy bone chew. this cost about £2 but i got plenty of material from it. just soak the bone in (initially) warm water and leave it for a day or two.. apply it wet and then it hardens and tightens as it dries and grips really well. i got the copper wire from trash. i have since wombled some electric cable from a skip and will experiment with melting and recasting the thin twisted copper wires inside at some point, though i still have enough of my initial find for a two or three more flakers. none of this cost me anything, except the rawhide dog bone, though i only used a fraction of that and have plenty left. so, you can sort your begining kit for next to nowt with a little care, attention and prep. happy wombling! When i do the copper boppers I melt a little lead into the copper cap for weight. One of the advantages I find of making your own stuff is you don't have to stick to making the regular old stuff and can experiment. Like that Egyption vid where he made the long sticky thing the ancient Egyptions used. Here's a couple of my experiments. I tried hafting the hammer stones on sticks and had good results, also I made a couple of dual soft hammer/pressure flakers from antler not wood, much more durable with one end of the antler you pressure and the other you hit, it's weighted. The Swiss Army Knife of knapping. The bottom is a pressure flaker using antler instead of copper, more durable you don't have to change the head so often as with copper, also you don't need to find an appropriate antler, inserting it in wood any antler fragment will do. cheers! i like the idea of hafting hammer stones a lot.. i have thought of wrapping a larger hammer stone in thin leather to try and make a softer impact (though i have yet to try this)- did you find that the hafted stone had a similar effect, ie more like copper or antler and therefor a smaller bulb etc? i like your multi purpose antler thingy a lot, the only reason i aint used antler so far is the expense of ordering it (ok, i am a bit lazy and absent minded too), and the fact that i dont tend to walk near where deer may shed - i think i just need to broaden my range and change habits a little to get different materials. have you ever tried wooden billets? i have given it a bit of a go, with ash, oak, holly, hawthorn and blackthorn without success. i did hear that fruit wood, seasoned and then soaked in sugar water and dried again can work, so this goes on the to do list (i have apple and pear in my stick store), but i suspect that flint may be too hard for this and it's more suited to more brittle stone. I have had a little luck with wood. I tried stuff I found, but nothing, then I bought a wooden pestle and it had a big heavy wooden grinder and that would do the job, but not well. In this vid he knaps with wood. 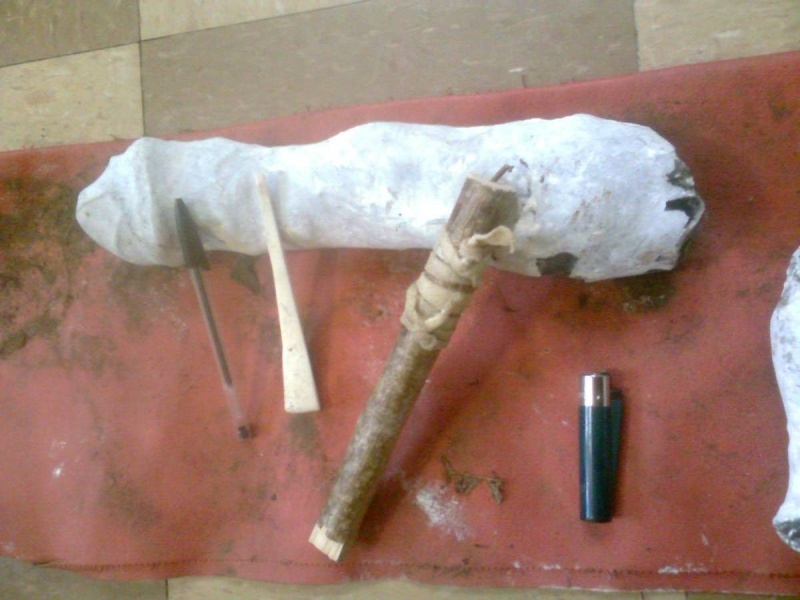 I even had a go at making one of the wooded stand things he holds the flint in. Again it didn't perform too well. I have tried wood many times, and the results aren't good! the best thing is antler or a hard(ish) sandstone pebble for flakes that will travel, and a hard quartzite pebble for tough roughing out and spalling. To me there seems to be a similarity to how he uses the wooden billet and stand thing, and the flintlock flint makers on your other thread? 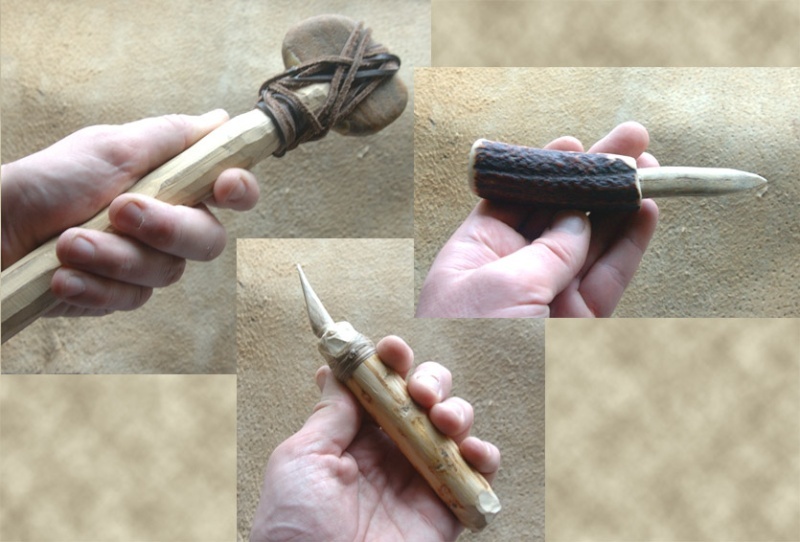 I actually had a go after seeing that and made something similar the what he used to hold the arrowheads for pressure flaking, with a little modification if looked like it could be useful............ Completely wrong, just no way to apply sufficient pressure when using that thing. I also seem to be building up a collection of 'tried out but don't work for me' tools.